Ever have one of those days where you look in the fridge and say to yourself, “Man, what do I DO with this stuff?” I have those often enough that I thought an “improv” section would be appropriate. So, ‘long about Thursday lunchtime, I looked in the fridge and had one of those moments. (Yeah, I’m behind on posting. I blame this on making the effort to provide pictures.) Targets of the day: sweet potato, radishes, avocado. I’d seen a recipe for radish chips, so I tried that out while I was making the sandwich. I wasn’t totally happy with the results, so you folks don’t get a description of that. I’ll let you know when I manage to make them to my satisfaction. The sandwich, on the other hand, was AMAZING. Flat-out-awesome. So I’m sharing it with you, and the next time you’re stuck with a sweet potato and an avocado, you’ve got an idea of what to do. Toss the sweet potato slices with some ground chipotle — as much as you like. I like things pretty spicy. 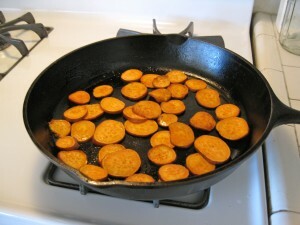 Saute the sweet potato slices in the olive oil, flipping halfway through. They should be cooked through but not mushy, so they provide a nice chewiness. While the sweet potato slices are cooking, make the guacamole and toast the bread. You could do this as a grilled-style or panini sandwich instead, but I wanted the guacamole to be a cool contrast, so I didn’t. 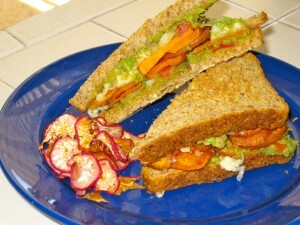 For each sandwich: spread the guacamole on both pieces of toasted bread. Place some sweet potato slices on one slice, top with the fontina (which should melt immediately from the heat of the sweet potatoes), and top with the other slice of bread. Cut as you like — I like my sandwiches cut on the diagonal. And that’s about it. Pretty quick, really easy, and super-super tasty. You gotta try this!